I literally threw this on when I woke up this morning as I had to go to a morning event. I'm 100% NOT a morning person but I really wanted to see the new OPI Spring Summer collections (post here!) so I had to get my bum out of bed and into Central London. It was worth it though as the collections were lovely! I still haven't got around to sorting out my nails yet, but I think tonight will be the night I paint them! I bought the Models Own Mirrorball collection before I moved house and still haven't had a chance to try that out yet! This hat suits you! I love the dress, so cute. Love the boots, very jealous of them! You really suit a hat too, and i really want to try the models own mirror ball collection. Amazing outfit, you are so cute! your new hair looks gorgeous, as does this outfit! your fur gillet is so perfect! gorgeous outfit :) love how the dress looks with the fur ! ooh i thought that was a coat and not a cardi + gilet, so freaking cool! Loving fur gilets at the moment, very chic! Lovely outfit, I love the dress especially! Love this look lily - the fur gilet is divine. Such a cool outfit! I love your dress so much! So jealous that you have the Models Own mirrorball collection, I need those polishes in my life! I love the boots so much:)! You look so amazing in that hat!! Wicked outfit. I'm not a morning person either. I do not think I could pull off that fur gilet but it looks so amazing on you - love it. always so gorgeous, i love this. I love the hat! so adorable.It's good to have you back! missed you! Really like the gilet! Wanted one myself for ages!! Such a lovely outfit! The gilet gives it great texture! 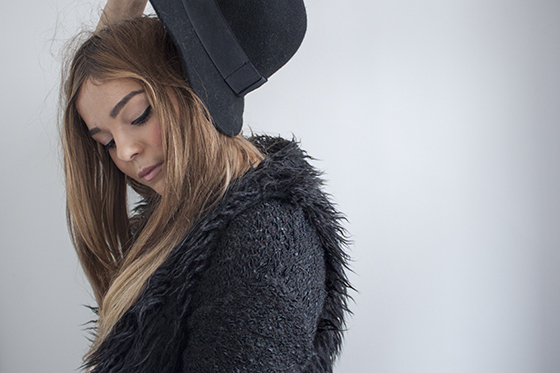 Lovely outfit, I love the fur gilet and the hat! very, very nice look! i love how the dress pops out of the blacks :) feelin jel about the gilet! lovely look, so funky and fun! Great gilet! Would not have expected it to be my taste but works really well! Great blog! Amazine.com is an avid follower! Love your lil hat! so cute! love the way you've put the gillet and cardi together! got similar boots and i love them! Looks awesome, would never say it was just something you threw in the morning! The dress and the hat are perfect! This dress is adorable, feels like its been made in candy land <3 Yes, its a compliment and not me being crazy. It is really adorable!